Ask any family researcher about tracing a family called Brown who had at least four generations named William and they will tell you that it's near impossible. But we have done just that through the research archives of Pam and Chris Ward. The story starts before the Brown family with their predecessors called Jeffery. In 1716 William Jeffery the elder, a yeoman farmer of Wadswick, wrote in his will of being weak and infirm of body but sound and perfect in mind and memory. Surprisingly for the time, he left land to all of his four male children, rather than just to the eldest son. To his second son John Jeffery he left land near Broads Tenement which had been purchased from Thomas Pearce, called Slableys, now the home of his son John and called John Jefferys Tenement. To his third son Thomas Jeffery he left his land in Rudloe formerly purchased of and from Mary Simpsion now the wife of Thomas Wiltshire. To his fourth and youngest son James Jeffery he left Viondells. We can see from Francis Allen's 1630 map that this area had previously been part of a common, strip field, near Maddocks Green. This had obviously been enclosed since 1630, possibly by Thomas Goddard, and a house built on the land. The bulk of his land went to his first son, William Jeffery. This land had been formerly purchased of my late father (also) William Jeffery deceased and in addition included the land being in the Chapell Fields ... which I formerly purchased of and from Thomas Goddard, late of Rudloe, Gent. None of the bequests was as important as his statements about his daughter Mary, wife of Timothy Browne, the smith, and his grandchildren Mary and John Brown. This is the first mention we have about the Brown family who later took over the whole of the Jeffery estate. William Jeffery the elder was buried at St Thomas a Becket Church on 25 February 1718. Many of the names in William Jeffery's will appear in the parish rates list of 1628 which enable us to get an idea about farming at that time. In 1628 most of the land in Rudloe was held by Zacharias Pouer (Power?) and Thomas Goddard, Gentleman, but these families had died out a century later allowing the arrival of the Jeffery dynasty. Thomas Broade was a smallholder with a tenement (house set in its own land) and divers other lands besides. The reference to Mary Simpsion is possibly related to the Sumption family who owned Box Mill in 1628. A yeoman farmer usually cultivated his own land, which he owned, unlike the tenant farmers of the medieval period. The farmstead became the centre of the business because the farmer's wife and children were actively involved in the work. Because the land was owned, farmers were willing to invest profits into their business for the sake of their children and the abolition of the ancient Court of Wards after the Civil War ensured the succession of private property and promoted increased investment. Freed from the stifling conformity of medieval communal farming, the families experimented with new grasses such as sainfoin and trefoil, which were highly nutritious, and root crops like turnips, which required less hoeing because of their broad leaves. These were the farming improvements adopted by the Jeffery family. The Jeffery family had been trying to establish an estate in Rudloe and Wadswick for a number of years. As early as 1628 another William Jeffery held a tenement in the area. In 1701, William Jeffery the younger bought part of the Wadswick estate of Thomas Goddard of Rudloe for a huge sum of £20.5s. 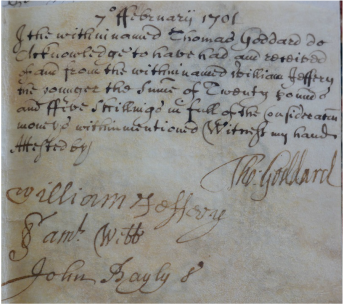 The signatures to the deed (left) show the level of literacy of the owners, although William Jeffery seems to be imitating the swirls and flourishes of the others in his handwriting. Also signing is the tenant of the land and the occupier. But the succession of the estate seemed to be doomed. By January 1727, James had died and William was obliged to help pay off the mortgage which had accompanied the inheritance to Thomas. We can see how close the family had remained with monetary gifts to Mary and Timothy Brown, but crucially missing is any reference to children of William Jeffery. On his death on 13 July 1738, William Jeffery left the majority of his estate to his brother Thomas Jeffery. 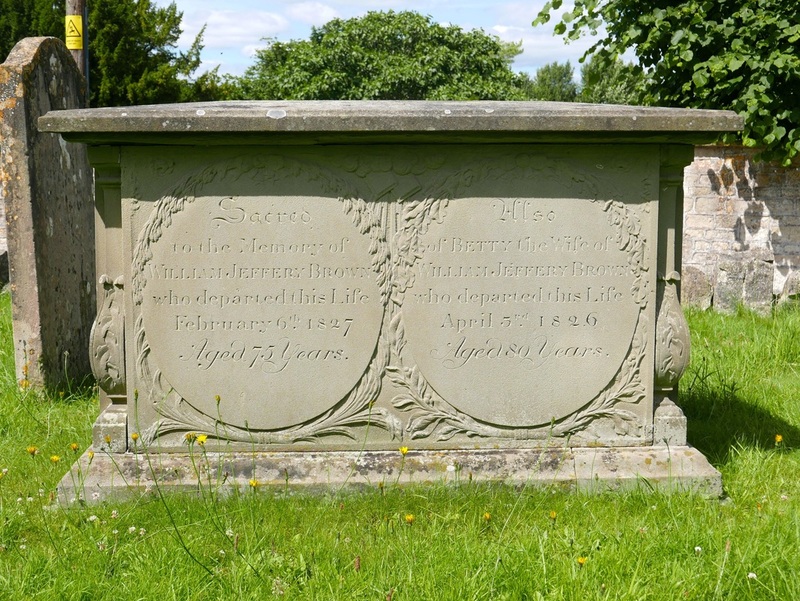 It was to no avail because Thomas Jeffery had no surviving children either and, in his will of March 1765, he left his land in Wadswick, Rudlow, Box and Hasilbury to be held in trust for his nephew William Brown of Westbury and thereafter to William Jeffery Brown, eldest son of William Brown. 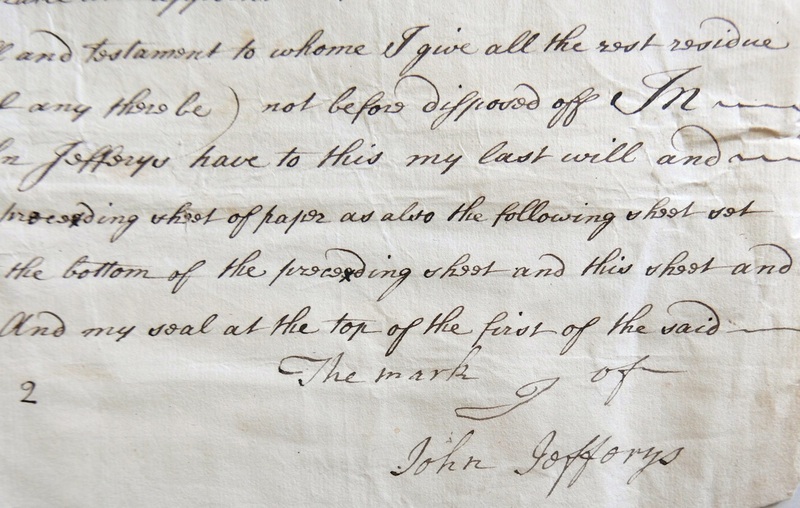 As a brief aside, a codicil to a will of the second son John Jeffery dated 1761 (shown left), shows some fascinating details about other aspects of the family in Box. It refers to Dr James Jeffery of Kingsdown, practitioner in Physic, perhaps a cousin. The story of the lunatic asylum at Kingsdown has been recorded elsewhere on the website and the proximity of the Jeffery estate and Jeffery's Cottage at the Old Jockey seems to confirm the connection with the Jeffery family of yeomen farmers rather than the involvement of Judge Jeffreys of the 1685 Bloody Assizes in Box village matters. John died in 1762 and his estate went to his brother Thomas for 30 years, then to his nephew William Brown of Westbury. 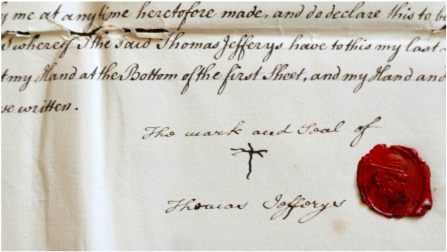 An amazing series of documents in the 1750s showed how the Jeffery family did business and the lengths to which they had to go to establish their estate. It ended with a hearing in the High Court of Justice, the King's Bench, in 1759. This was a highly turbulent period in the whole of the world. Britain was involved in a conflict called the Seven Years War against France in Europe, Canada and India, which included memorable events such as the Black Hole of Calcutta, the execution of Admiral Byng, victories by Clive of India in Bengal and General Wolfe's capture of Quebec. Against this backdrop taxation to pay for the war was highly likely (and indeed led to the War of American Independence within a decade). On 3 January 1759 John and Thomas Jeffery had nominally granted their land to Richard Maddock, Gent of Crane Court, Fleet Street, London. The land was extensive: Home Close, Barley Leaze, Swinleaze and Coppice, Great Innock and Little Innock, Kingsmore Close, Thistle Close, Beazers Leaze, Eastway Mead, Long Close, Tubbs, Weavern Holys, Parkers Leaze, Rudleaze, Chappel Field, Tynning Inn and more. Maddock was a lawyer who was involved in various other local Lease and Release land transactions. These were intended to open the freehold of the land to allow it to be later sold or transferred. On the next day 4 January the property was released from the tenancy, and this agreement also listed John Bailey of Pickwick, who was the real tenant of some of the land. The Jefferys had relieved their land of any past obligations, but the tenancy of John Bailey had also been dispensed with. By 12 February Bailey had realised that he had lost his rights and appealed to the King's Court for restitution in 90 acres of land, 10 acres meadow, 40 acres pasture and 10 acres of wood for all manner of cattle in Wadswick, Rudlow and Box and Hasilburye. The court eventually found for Richard Bailey and against the Jeffery brothers. By tradition, the year 1759 is known as Britain's Annus mirabilis because of the military victories; it wasn't so wonderful for the Jeffery family. On the death of Thomas Jeffery in 1770, the whole of the family estate went to William Brown of Westbury and his heirs because none of the four Jeffery sons had an heir to succeed them. Tracing the family story gets harder at this point because there appears to be four generations called William: William of Westbury (b 1723); his son William Jeffery, the elder; his son William (b 1780); and his son William Jeffery the younger (1822 - 1903). The Brown family continued to acquire property in the area and to consolidate their holdings. In 1790 William of Westbury and William Jeffery Brown the elder exchanged land with Robert Fowler of Melksham and later acquired part of Rudloe Farm from him. They acquired land both to farm themselves and to let out for an income. In 1776 they let out part of Home Farm to William Godwin. And they were sufficiently important to do business with William Northey, lord of the manor of Box, in the course of which they acquired Vinols arable, North Croft, Cowleaze and Collets Close. The Browns continued to develop their estate and to pass it through the generations. In the course of this they rose quickly up through the Victorian social scale. 1852 William Brown the younger, of Wormwood House, passed his assets to his only son, William Jennings Brown, now calling himself a gentleman. William the younger died on 31 January 1868 also calling himself a gentleman and left his household goods to his wife Mary, then to his daughter Elizabeth, wife of John Hayward. This was a reference to another family that became an important part of the later story. The bulk of the estate went to his son William Jeffery Brown whose story is recorded elsewhere on the website. He exhibited the yeoman farming skills of his ancestors and won the cup (seen at heading) for a ploughing contest at the Chippenham Agricultural Show in 1845 and became All-England Ploughing Champion. By then the family were amongst the most important people in Box. William Jeffery Brown owned land at Wadswick, Wormwood and Hazelbury and was a Guardian of the Poor, helping to run village matters. When he retired from farming he lived in splendour at Middlehill House until his death in 1903. He is buried in Box Cemetery. By then the golden age of yeoman farming was over, killed by the farming depression that hit the industry after 1880, a lack of investment and falling land values. The estate has been broken up and gradually sold off since then. Some members of the family still survive outside the Box area. The Wadswick land went to the Hayward family who let it out. John Carey (known as Jack) Hayward owned Wadswick Farm which he let to the Hazell family. 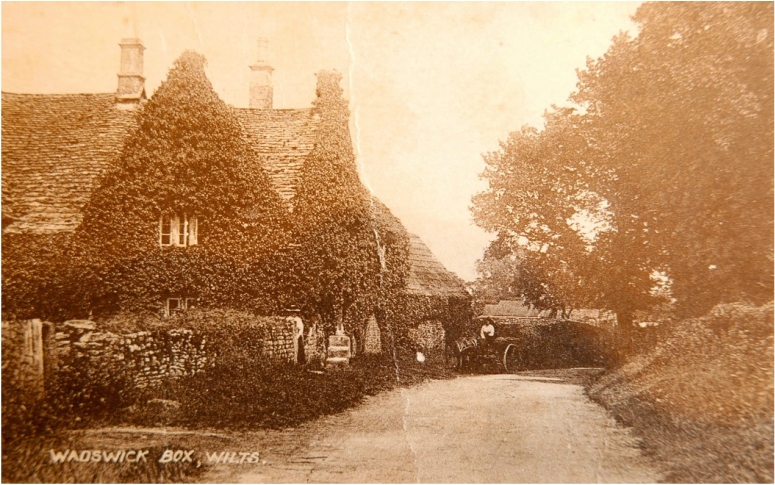 Roger Barton acquired the old Bailiff's Farm and changed the name to Manor Farm. 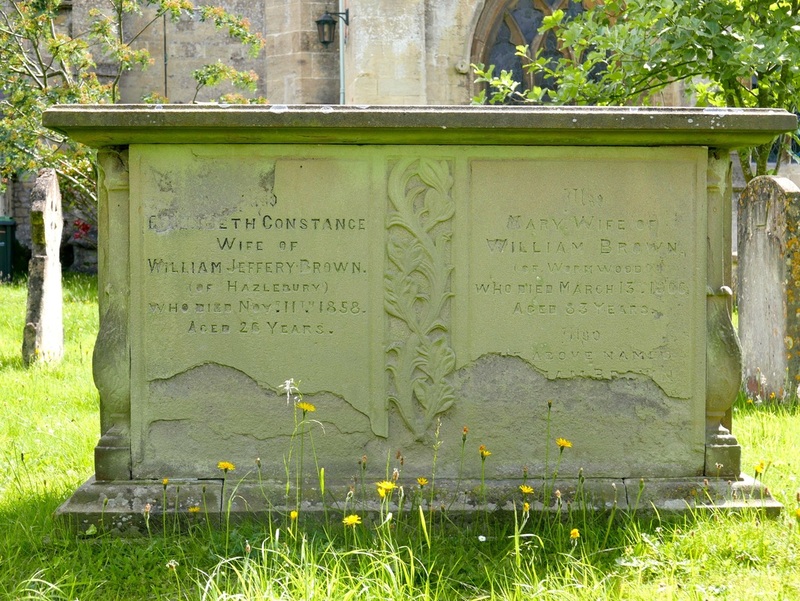 Several members of the Brown family are buried in Box Churchyard, including William Jeffery Brown, senior, died 1827, and his wife Betty, died 1826 (below left) and Elizabeth Constance, wife of William Jeffery Brown, younger, died 1858 aged 26, and Mary, wife of William Brown, died 1866 aged 33 (below right). This story of Georgian farming at Wadswick illustrates many fundamental aspects of Georgian life, the advances in loan and mortgages following the formation of the Bank of England in 1694, just how litigious people were, and, above all, the importance of passing on their estates. The Jeffery and Brown families are fascinating examples of the rise of yeoman farmers in Box. In the next issue we look at the story of two individual properties they owned at Wadswick and how their value see-sawed in Victorian times. Wiltshire History Centre. The rates list recorded the amount due from each resident to support the people and infrastructure in the village.